After eight months with no visitors, Karen (Carrie’s childhood friend), Ben (who Carrie used to nanny for) and Michelle (Karen’s friend) all coordinated the start to their backpacking trips to meet up for a few days in Hong Kong. It was great to have the company, though all of us trying to cram into a teeny Chungking Mansion hotel room was an exercise in cramped living. When not squeezing into a closet-sized room, we spent our days exploring the country. Our first stop was downtown Hong Kong Island. Personally, as a New Yorker I felt right at home wandering the streets and craning my neck to look at the amazing skyscrapers around me. Though, I must say, their architecture beats ours hands down for the most part. More skyscraper viewing awaited us at the end of our cable car ride to the top of Victoria Peak, though I had to laugh that all there was to do up there was see the skyline and shop in one of the two luxury malls that the cable car let visitors out in. Back on sea level, we were excited to stumble across a little printing stall where a man still used an original Heidelberg printing press before heading over to the stamp market. Located down a side street, the market is lined with stalls all selling customized stamps made from anything from rubber to marble and other stones. Another day we headed to Lantau: one of the further out islands that make up Hong Kong. The boat trip was gorgeous and gave me a whole new set of skyline views to take photos of. 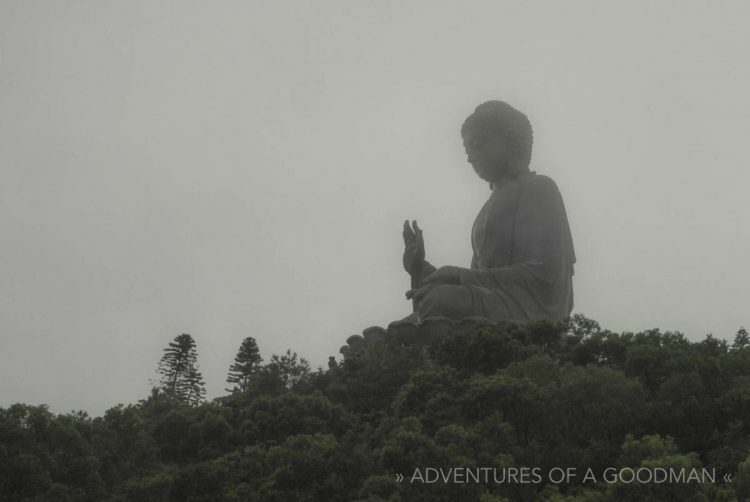 The main attraction in Lantau is the Tian Tan Buddha statue, which up until 2007 was the world’s largest tallest seated outdoor bronze Buddha. It’s funny how many classifications there are so that every country can have the world’s largest XYZ Buddha. I’m sure that somewhere one can find the world’s largest laying down Buddha that has one eye closed, is made of marble and is on top of a mountain no bigger than 500 meters. Bad jokes aside, the statue was beautiful in its own right and only enhanced by being hidden in a layer of fog and clouds. Next to the Buddha was the Po Lin monastery, which featured some amazing Chinese statues, shrines, offerings and locals burning the largest incense sticks I have ever seen. Seriously, imagine a roll of half dollars three feet high that is decorated so beautifully that when it burns the Mandarin characters are still visible in the ash. While Carrie and I have seen countless Buddhas and monasteries on this trip, we agreed that it was a nice way to finish up.